Related Content: Which Themes are Installed within Office Versions? You can laboriously select the text on each Master and individual Layout in Slide Master view, and then use the Home tab | Font group, and click the Dialog Launcher. Then, in the resultant dialog, remove the checkmark next to All Caps each time. Would VBA provide an easier and more elegant solution? Steve Rindsberg of PowerPoint FAQ and PPTools believes you can get the job done in less time it took you to read this paragraph! Do note that Steve’s code will not change your text to Sentence case or Title case–it merely removes the automatic UPPERCASE. 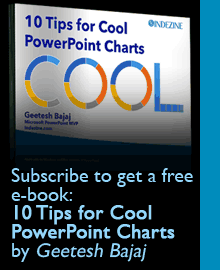 First you need to know how you can run VBA scripts in PowerPoint — then use this code. Explore the code a bit though. Once you have placed this code in the VBA editor, close the window to get back to your PowerPoint window. Before you proceed further, it’s a great idea to save your file — be sure to save as a PowerPoint Macro-Enabled Presentation with the PPTM file extension. If you save as any of the other file formats, PowerPoint will offer to remove the macros, and then, of course, the code to change from UPPERCASE to default case will not work! See our PowerPoint File Formats page to learn about these file formats. Then open or switch to the presentation with the UPPERCASE text and run the macro. To do that, press the Alt F8 shortcut key. 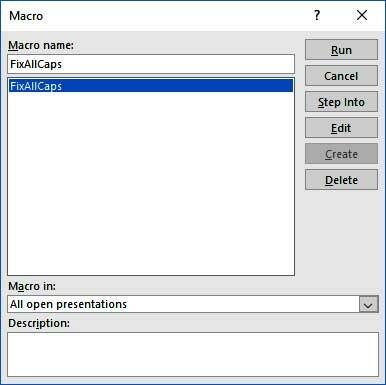 In the Macro dialog box that appears, next to Macro in: choose All open presentations, as shown in the figure below. Click the FixAllCaps Macro name, and then click the Run button. You can see the end result in the Figure below. Compare with a Figure of the same slides, earlier on this page, and you will notice that the word, AVOID is still in all uppercase. That’s because the original text was in uppercase and this VBA code does not change any text at all. Rather it removes any automatic UPPERCASE forced onto you! This VBA code works on all placeholders–even body text in Content placeholders! We tested this code on a presentation that used the Main Event theme that uses UPPERCASE for all body text. Do note though that this code works only on text placeholders, and leaves text boxes alone. It also does not make any changes to text in shapes, charts, and elsewhere.